What Is Horseradish and How Is It Used? Horseradish packs a bite. It is most widely used as a condiment, both by itself and as an ingredient in sauces and dressings. Prepared horseradish is readily available at the grocery store, but you can make your own. You just need to follow certain steps so you don’t have to suddenly run from the kitchen due to the pungent odor. Prepared horseradish is a condiment made from the large, white root of the horseradish plant, which is in the same family as mustard and wasabi; it is a cousin of broccoli, cauliflower, and Brussel sprouts. The leaves are also edible. It can be grown in your garden as a perennial in hardiness zones 2 through 9. The root is harvested to use as culinary horseradish and offsets are replanted for the next year's crop. The grated root can be used fresh, or it can be dried or powdered. You will often find horseradish added to condiments such as mustard or mayonnaise to lend them an extra bite. Horseradish sauce may simply be grated horseradish in vinegar, or it can be a creamy version. Horseradish is native to Russia and Hungary and has been grown throughout recorded history. Mentions of it are made in Greek mythology, Pliny's "Natural History," and Shakespeare. Prepared horseradish is made with grated horseradish root, vinegar, and salt. Prepared horseradish is not the same as horseradish sauce but is an ingredient in it. Horseradish sauce combines prepared horseradish with cream, sour cream, or mayonnaise, which makes it milder and creamier. The volatile mustard-like oil in horseradish brings tears to the eyes and heat to the tongue. Isothiocyanate is the compound that gives off the heat when exposed by eating or crushing horseradish. Vinegar neutralizes the reaction and stabilizes the flavor. It should be added immediately to fresh grated horseradish to produce a milder taste. Horseradish is at its best and most flavorful when freshly grated. There are bottled varieties, but grating it on your own will be more pleasing for your palate. Horseradish can be grated by hand, but it is easiest with a food processor. Like mustard, the heat and fumes begin to rapidly deteriorate once the horseradish is cut or grated and exposed to air. In cooked dishes, horseradish is added at the end of cooking as heat eliminates both the root's aroma and zing. Horseradish is versatile and can be used for meat and vegetable dishes. Fresh horseradish or a creamy horseradish sauce are often served as a condiment for steak or prime rib. Chrain, which is a beet and horseradish sauce, is the traditional accompaniment to gefilte fish. Add horseradish to make amazing deviled eggs, spicy potato salad, and a homemade mayonnaise that has a great kick. You'll also need prepared horseradish if you are going to make a bloody mary cocktail. Horseradish is available year-round in most places in the United States, but harvest season is in the spring. The fresh roots are usually sold in 2-inch long sections and can be found in the produce section. Although the flesh of the horseradish is white, the root is covered in a thin, brown skin. The roots are usually an inch or so in diameter and when not cut into sections they can be several inches long with a bulb-like end. When buying horseradish roots, choose those that are firm, not soft. The roots should not show signs of mold or have green spots. Roots that appear dry or shriveled are not ideal, either. Bottled prepared horseradish is readily available in the refrigerated condiment section of grocery stores. Horseradish sauce is found in the condiments section. Dried horseradish is also available in many markets. To make a prepared horseradish to use as a condiment, you will need a food processor or blender, vegetable peeler, knife, horseradish root, white vinegar, and salt. An airtight glass storage container is preferred if you are not going to use it immediately. Before you start, make sure you open up some windows to create a source of ventilation; once you begin to cut into the horseradish root, the smell can take over. Peel the horseradish root. If using a food processor or blender, cut it into cubes. If using a hand grater, cut the piece of horseradish in half lengthwise. In a blender or food processor, pulse the horseradish to your desired consistency. The finer the consistency, the more pungent the horseradish will be. If using a hand grater, grate the horseradish. Grating is when the pungent odor kicks into high gear, so be prepared. Add vinegar and salt to taste. The longer you wait to add the vinegar, the hotter and stronger the horseradish will be. Don't wait too long as grated horseradish root will quickly turn bitter unless it is mixed with vinegar. Store the prepared horseradish in the refrigerator for up to six weeks. Store horseradish root unwashed in a plastic bag in the vegetable drawer of the refrigerator. Use it within a week or two as the cut root will dry up. Freezing the unprocessed root is not recommended. Grated horseradish should be used within a few days, or can be frozen for up to six months. If you have added vinegar to the grated horseradish you can keep it up to six weeks in the refrigerator. Bottled prepared horseradish will last up to three months in the refrigerator. However, it quickly loses pungency and is best used within three to four weeks. It should be discarded when it turns dark. Freezing prepared horseradish is not recommended. 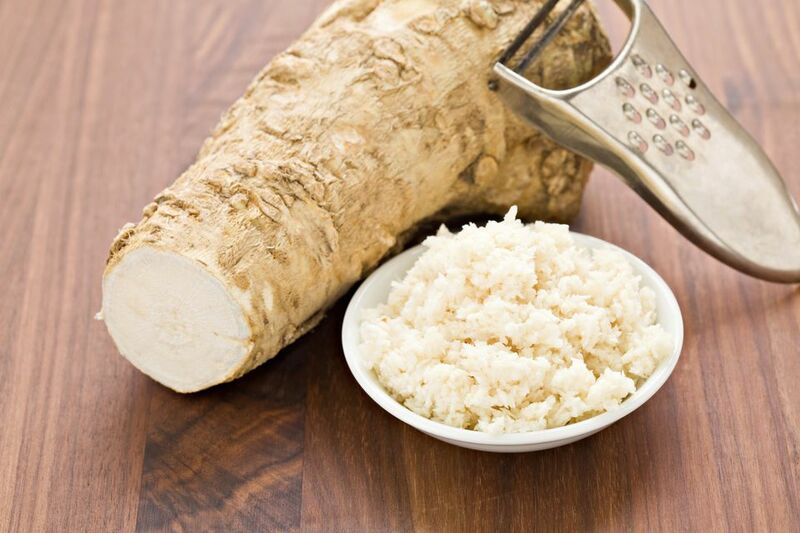 One of the biggest benefits of horseradish is that it adds a big burst of flavor while having very few calories and no fat. There are only 4 calories in 1 teaspoon of prepared horseradish.